Ebridge towermill stood on Mill Hill just to the south and on the opposite side of the road to Ebridge Farm, which was technically in Witton. 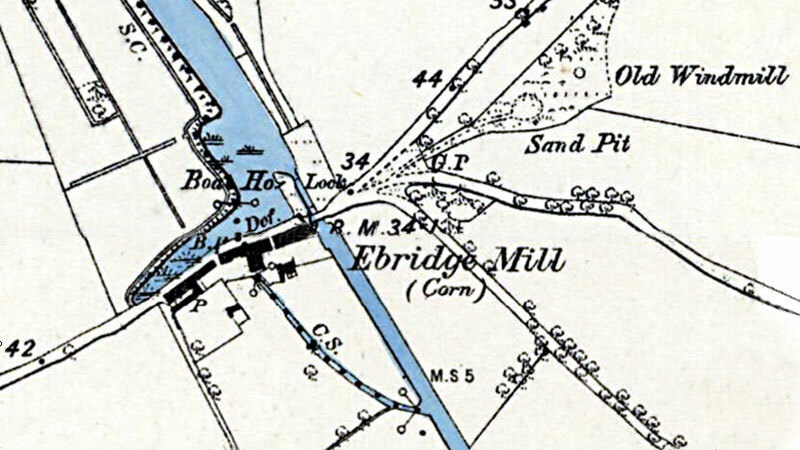 The mill was run in conjunction with Ebridge_watermill for all its working life.1870. The mill was four storeys tall and had a stage; it used patent sails set on a cast iron windshaft to drive two pairs of French burr stones. Late the property of Mr. William PARTRIDGE decd. Lot 1. Comprises all that superior and highly reputed WATER CORN Mill situate in North Walsham and Witton aforesaid & late in the occupation of the deceased Proprietor. Piece of land on which the windmill stands, 5a. 1r. 5p. more or less... Lease etc. Apply to William PARTRIDGE, son of deceased or to Mr. WILKINSON, Solr. North Walsham. No. 259: Wind Mill Hill & Premises. Pasture . Also a BRICK TOWER WINDMILL with patent sails and cast iron shaft built only a few years since of the best materials on a lofty hill within 100 yards of the Water Mill. This Mill drives two pair of French Stones, contains four floors and is in every respect fitted up and adapted for occupation with the Water Mill. Of this Estate 1a. 1r. 2p. with the barn, principal granary and other Buildings standing thereon are Freehold. 5a. 1r. 5p. with the Windmill standing thereon are held under a lease for 21 years granted by the Rt. Hon. Lord Wodehouse and others to the deceased on 6th April 1832 in which the lease is contained a covenant by the lessors allowing the lessee to remove the mill at any time before the expiration of the term. Outgoings - Reserved annual rent to Lord Wodehouse £3. The residue of the Estate ... lease ... 21 years ... Bishop of Norwich to deceased on the 18th day of September 1837. Apply to G. Wilkinson, Solr. North Walsham. Late the Estate of Mr. William PARTRIDGE deceased. 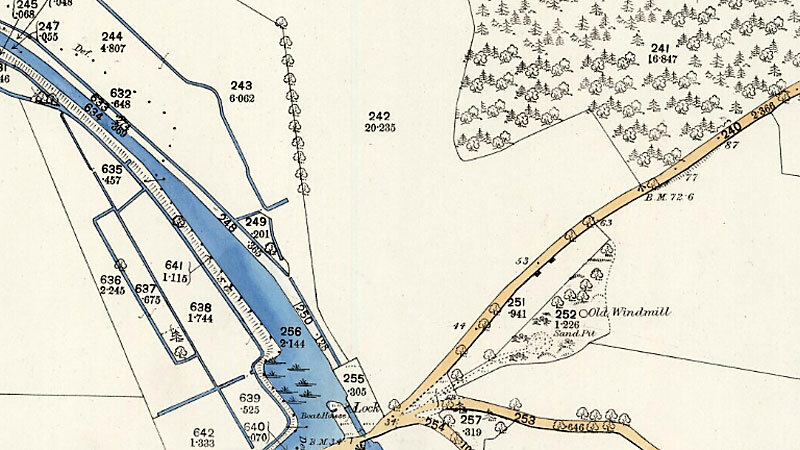 Also a fine piece of land on which the Windmill stands containing by admeasurement 5a. 1r. 5p. more or less ... held under a lease for 21 years granted by the Rt. Hon. Lord WODEHOUSE and others to the late proprietor on the 6th April 1832 in which lease is contained a covenant by the lessors allowing the lessee to remove the mill at any time before the expiration of the term. Singular Accident to a Mill. 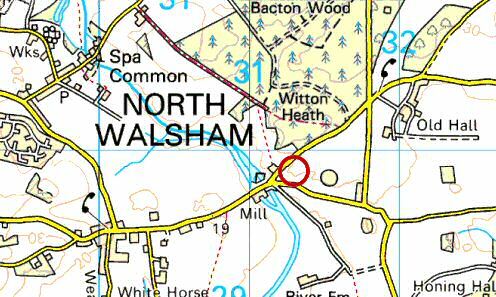 The tower mill occupied by Messrs. Bevor & Press, millers & merchants of North Walsham, was on Sunday morning discovered to be on fire. Soon after midnight of Saturday the wind suddenly rose very high and strong indeed and appears to have so completely taken the mill tail to wind that all the vanes of the sails were closed and the flyers had no power to regulate her. The result was that the sails turned the backwards way, having broken from the gripe and from the velocity with which they went round, the works caught fire from the friction. The destruction went on (the mill being some distance from the dwelling) till about half past seven, when an alarm was given by the man who went to see after the horses. The top of the mill is a complete wreck, her shaft and sails having fallen to the ground and the top part of the mill may be said to be quite destroyed. In the towers floors there was a large quantity of corn, which fortunately sustained no damage as the fire and ruins fell outside. The falling of the shaft knocked down much of the brickwork which from its weight must have come down with a tremendous force. The damage sustained is from £100 to a £150. We learn that neither the mill nor the stock was insured. George Youngman was listed as a journeyman miller on the 1841 census. He was the son of Isaac Youngman who ran the Yarmouth Road towermill in North Walsham. 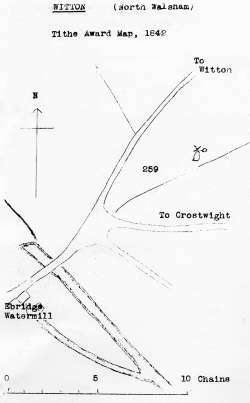 George Youngman later moved on to run Witton Mill Farm postmill. William Partridge snr (75) miller. William Partridge jnr (45) miller.